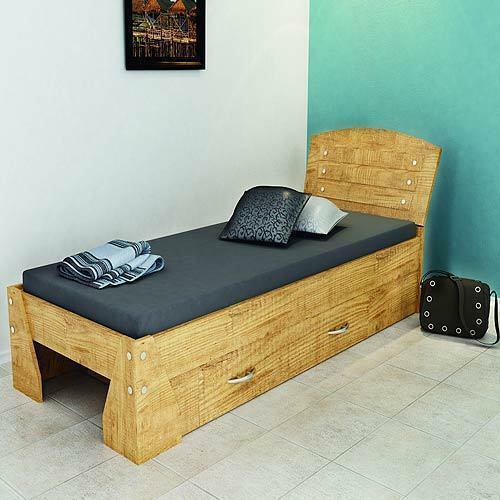 Owing to our designers we are able to come with an exclusive range of Single Bed Sleek. Furthermore, designed in line with the prevailing fashion trends of the markets these beds can be availed in customized forms. The offered beds are being highly demanded owing to their remarkable attributes such as longer service life, fine-finish and high compressive strength. Banking on rich industrial experience, Jatin Enterprises are engaged in manufacturing, supplying, distributing and wholesaling a wide array of Furniture in both standard as well as customized form. Under this array, we offer Folding Bed S.S. And M.S. Pipe, Office Work Stations, Office Chairs, Camden Corner Furniture, Wine Tables and Hotel Reception Desks, to name a few. With an aim to make our offered furniture stand tall on the expectations of patrons, we manufacture these using high grade raw material, as wood, iron and other components. To ensure that raw material is high in quality, we source it from the reliable vendors of the industry and test the same before usage. Further, in the manufacturing process, we take aid of modern machinery and latest technology to design the furniture as per the prevailing trends of the industry. Moreover, while carrying out the manufacturing process of offered furniture, we are assisted by the expert professionals, who are the experts of this domain. These professionals ensure the offered furniture is manufactured in-sync with international quality norms. Our expert professionals are experienced, qualified and knowledgeable, supported by whom we are able to cater to the varied needs of our patrons. These professionals work in dissected units of our sophisticated infrastructure while maintaining close coordination with each other so as to avoid any confusion. By making use of all our amenities, the professionals ensure to stand tall on the expectations of patrons.